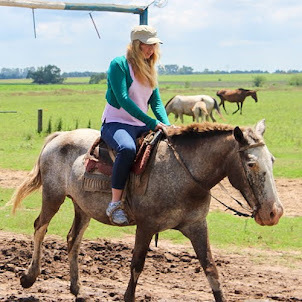 Our journey began at 9am when we were picked up from our resort and started the trek to our first destination. A 45 minute drive, we drove right through the heart of Da Nang and its pristine white beaches. If we had a few extra days I definitely would have stayed here in a heart beat. 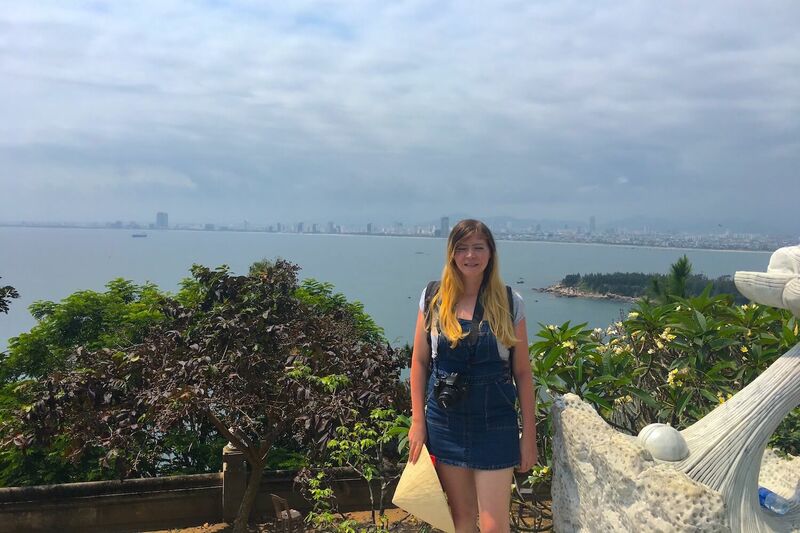 We arrived at a busy parking lot on Monkey Mountain and I got a minute to admire the vista of Da Nang in its entirety before I was whisked away by our guide. Our guide walked us to Lady Buddha, the tallest Buddha statue in Vietnam at 67m. We spotted the monolith as we were driving towards the mountain, but up close the detail is even more stunning. It's more than just a statue though, there is a flight of stairs that leads to 17 floors with each floor dedicated to a different Buddha (unfortunately the interior is off limits to the general public - monks only). We strolled around the courtyard and through the temples and monks' living quarters. While for us this place was interesting in terms of sightseeing, for many Vietnamese this area is very spiritual and you will see many locals praying in the temples and monks tending to the gardens. Beyond the courtyard near the monks' houses we spotted a large group of happy looking dogs of different breeds lazying around. Our guide told us the dogs are cared for by the monks and are an important part of the community in the Linh Ung Pagoda. 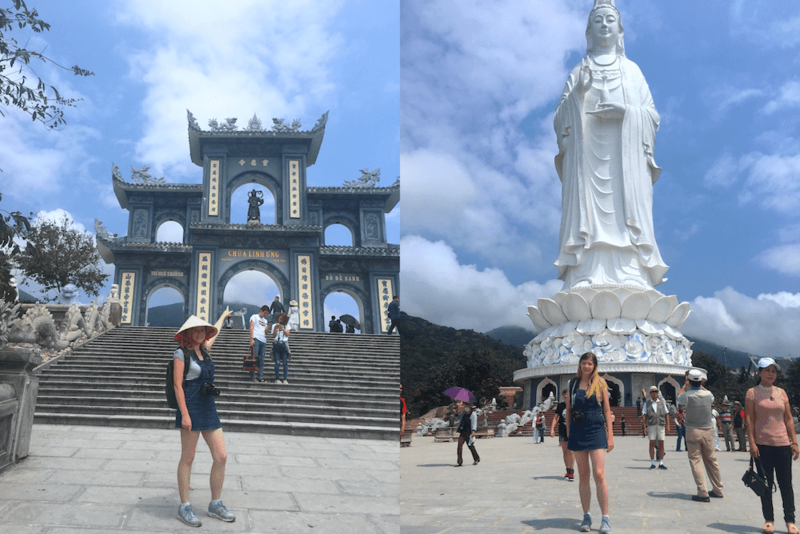 Our clever guide took us to the entrance gate of the pagoda last so we didn't have to climb up all those marble stone stairs at the beginning (good tip actually - seriously, I was tired under the heat just walking down them - theres way more than you can see in the photo). Our driver picked us up and took us to our next stop. Apart from Lady Buddha that can be seen atop Monkey Mountain from all corners of Da Nang, the 666m long Dragon Bridge is the most ubiquitous symbol of Da Nang. Our guide stopped right here and told us that it is especially gorgeous at night when it lights up and dazzles the sky with fire from the mouth. Absolutely iconic, I wish I could have soaked up the ambience at night with a cocktail by the waterside (theres always next time, right). Maybe cooler than the Dragon Bridge is the Love Bridge just a few hundred metres down the Han River. Driving past I wouldn't have even noticed it, but what I love is the story behind the bridge - our guide told us the bridge was commissioned and paid for by the citizens of Da Nang, so they are very proud of it (more so than the Dragon Bridge). Built on the idea of love bridges around the world, the bridge is built with metal bars and thousands of locks on it with inscriptions of each couples' undying love. After a Vietnamese lunch we headed to Marble Mountain. From the street you can spot a bit of ancient mixed in with the modern - an old pagoda right next to a glass elevator for the people who don't want to climb the 150 steep stairs (we took the stairs because we are so adventurous). From the top you can see how odd the landscape is - a cluster of five mountains peeking over flat land. Each mountain is named after a different element (wood, fire, water, metal, earth) but tourists are only allowed on the Water Mountain. 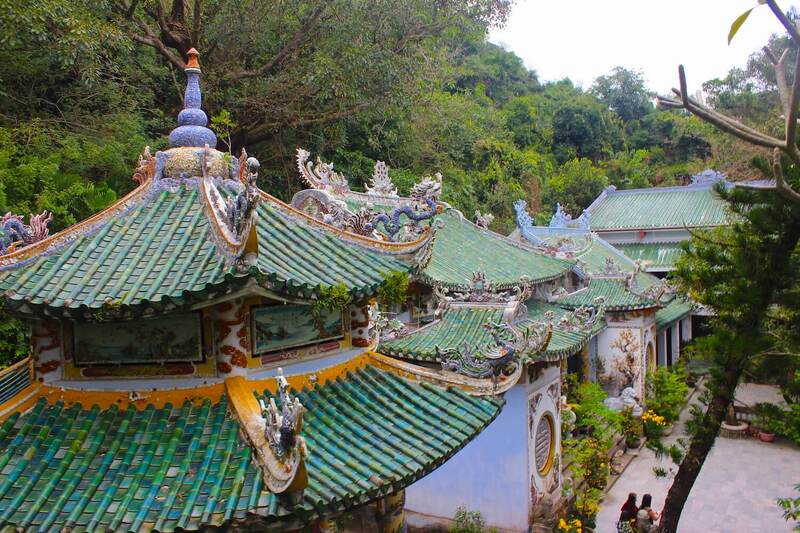 Atop the mountain there are intricate statues of Buddha, 12 headed dragons and a number of temples and pagodas. Like Monkey Mountain, this isn't just a place for sightseeing, it is a very spiritual area and you will spot many locals and monks praying rather than sightseeing. But for us the sky-high backdrop next to the temples was enough of a visual treat without the personal spiritual element. Little did we know the best was yet to come. After 45 minutes of getting sweaty and taking too many selfies our guide enthusiastically told us we had reached the highlight of the day. Not knowing what to expect we were lead into a narrow cave lit only by the odd lamp here and there. My claustrophobia almost got the better of me until we reached a huge cave. Inside the cave there were 5 shrines and one large Buddha across the entrance. I was amazed and did not expect to find this mysterious space in a mountain - I felt so humbled and appreciative of the wonder around me. Walking down the steep stairs to the floor of the cave and to a small corner our guide took us to a line of little old Vietnamese ladies. Inside a small cavity in the cave wall was a wet stalactite dripping. The ladies were putting their hand under the water and patting their heads, some repeating this motion more than a few times. Our guide explained to us that it is believed this stalactite is the "breast of God" and the water is a fountain of youth, so it is good luck to take some of the "holy water" and splash it on your head, so we did just that. At this point I realised how grateful I was to have come here with a guide because there are no signs about this anywhere. Leaving the cave we noticed four elegant statues. According to local legend, the cave is guarded by these four statues, two representing soldiers and two representing Mandarins of the Court. I really wish I had a few extra days to explore Da Nang - this was one of my favourite days so far and I feel like there was so much more to explore. If mountains are your thing our guide told us Ba Na Hills can be accessed by the longest cable car in the world and is home to a replica French town. A short drive from Da Nang is the My Son heritage site, similar to Angkor Wat according to our guide. 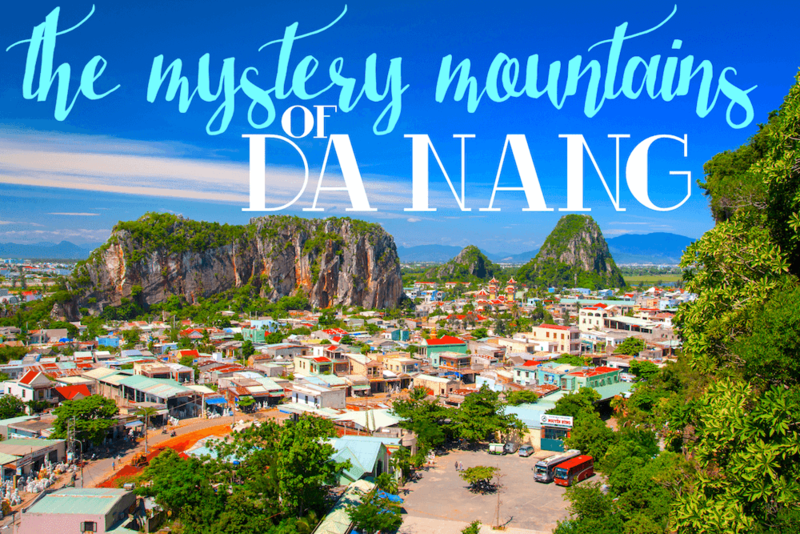 Da Nang is definitely more than a 1 day city, it all depends on how much time you have.